Being winter, I’ve spent most of the past couple of months making items for others. I figured now is the time to treat myself to a little something-something just for me. Enter Mosey, a pair of totally sweet cabled legwarmers. I’ve never actually worn legwarmers in the past, but hey, there is a first time for everything. Might even get me more interested in trying out new combinations with what’s already in my closet (something I have issues with). My legwarmers are being knit from Crystal Palace Yarns Merino in a solid slate (dark grey) colour on size 4.5mm needles. The yarn was bought with a gift certificate to Birkeland Bros Wool (see my previous blog post) by my lovely former co-workers as a thank you gift for all the hard work I’d done in the past three years. Its good to be appreciated! The pattern is a bit weird because it has two charts that are read simultaneously; however, the charts have a different number of rows to them. This caused a week of zero progress as I just didn’t plum have a clue on what to do. I asked another knitter friend and she was stumped too. A search on Ravelry of other knitters who had completed this project lead me to a wonderful discovery that a very smart lady had recharted the whole pattern into one large chart. Huzzah! Onward I went, and now I have completed one legwarmer. 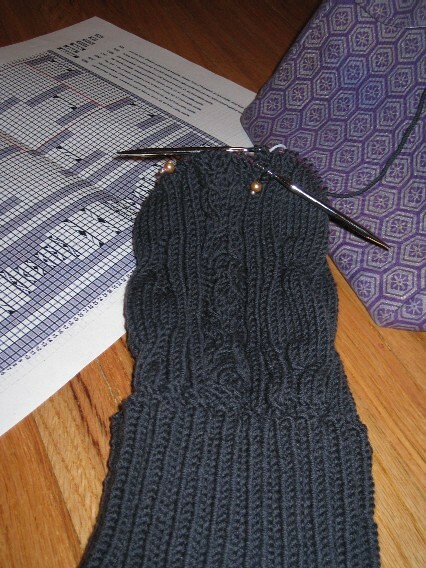 Just need to catch up with the second one (the ribbing’s already done) and I shall be ready for springtime in Vancouver. In other news, I have 2 hat orders to make! One is a commissioned knitting, and the other is a belated birthday present for my kinesiologist who is helping me get buff again after my 3 car accidents. More on these later. You are currently reading Mosey-ing On… at When Gaia Smiles.